To northern hemisphere English speakers, the New Zealand accent is virtually indistinguishable from that of its giant Australian neighbour. But difference are there, and reflect the different histories of settlement and aboriginal relations of the two antipodean nations. Unlike Australia, which was probably settled by humans over 50,000 years ago, New Zealand was the last habitable landmass in the world to be colonised. The Polynesian ancestors of the Maori arrived only at about 1150-1200 AD, several centuries after Scandinavians and Inuit arrived in Iceland and Greenland. The first English-speaking settlers arrived in Aotearoa (to use New Zealand's Maori name) in 1792; they were Australian rather than British, and were sealers from the recently established penal colony at Port Jackson (now Sydney). The trickle of settlers from Australia and Britain (and Ireland and America) increased during the early 19th century, and became a flood after British and Maori chieftains signed the 1840 Treaty of Waitangi, the founding document of New Zealand. Large-scale organised settlement from both Britain and Australia began, and by mid-century the indigenous Maori were outnumbered by the incoming Pakeha (as people of European ancestry were and are called). All these settlers naturally brought their own accents and English varieties along with them, creating what Canterbury University researcher Elizabeth Gordon has called a "mixing bowl" . The primary ingredient in the "salad" was Australian, itself derived from southeastern England dialects; plus considerable input from Scottish and Irish varieties, and seasoned with the prestige of RP English. However, recent research by Laurie Bauer of Victoria University has shown that the vocabulary of New Zealand English (henceforth NZE) can be traced back to areas all over Britain and Ireland, probably "pre-mixed" in Australia before coming to New Zealand. Even some American terms entered at this time, including "creek" in its American sense of "stream" rather than British "estuary". One additional very important source of NZE vocabulary, and that which makes it uniquely different from any other English dialect, is te reo Maori-the Maori language. As the North American colonists borrowed hundreds of words from Native American and First Nations peoples, so the Pakeha appropriated a large number of words to describe phenomena unknown to them. While the large Australian continent was inhabited by scattered groups of gatherer-hunters speaking over 200 distinct languages, New Zealand was occupied by a largely agricultural people speaking a single language. It should also be said that while the Maori were persecuted by the Pakeha settlers, they were not victimised (or even exterminated) like the Aboriginal people of Australia. This all made for a single unified source of Pakeha borrowings. Most of the Maori words coming into NZE were for plants and animals-trees like kauri, tötora, and rimu; birds like the extinct giant moa, the eponymous kiwi, the white heron or kötuku, and the songbird tui; and fish and shellfish like hoki, toheroa, and cockabully (from kökopu-a small freshwater fish). But cultural words were also borrowed, like whare nui, "meeting house"-literally "big house"; marae, "ceremonial ground"; mana, "authority"; and tapu, "sacred, taboo". Since the Maori language is closely related to Hawaiian, Tahitian, Samoan, and the other Polynesian languages many of these words can be found all over the eastern Pacific. Clearly then, the closest dialectal relative of NZE is Australian English; indeed, in many ways NZE is descended from Australian English (although Kiwis don't like to be told this!). South African English is also fairly close, as all three southern hemisphere countries were settled at roughly the same time. The ties go back to southeastern England and RP. Some have tried to derive both NZE and Australian English from the Cockney accent of London, but this is a gross overexaggeration; the two accents share some features, but differ markedly in others (e.g., h-dropping and /-t-/ glottalisation in words like "butter"). 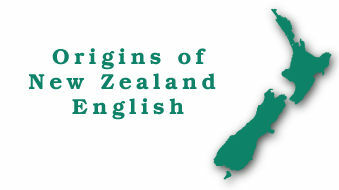 Since this article appeared in 2000, important new evidence on the development of NZE has been published by the Origins of New Zealand English project at the University of Canterbury. This is derived from a unique database: recordings of 325 elderly New Zealanders born between 1850 and 1900 made in the 1940s by the New Zealand National Broadcasting Corporation. Some 83 of these have been edited by Peter Trudgill, Elizabeth Gordon, Gillian Lewis, and Margaret Maclagan (2000a, b; see bibliography), and provide important insights on the beginnings of NZE and new dialects in general. First, it is now apparent that much of the resemblance between NZE and its Australian sibling is not so much due to inheritance from Australian to its NZE offspring as to similar developments in both dialects because of similar inputs from English, Scottish, and Irish dialects. This took place through the process of dialect mixing and levelling: the blending of the British input dialects and the elimination of minority or marked features (e.g., h-dropping and w-wh merger). Secondly, some of the NZE-Australian resemblances are due to the phenomenon of drift, as originally put forth by Edward Sapir in his classic work Language (1921). Drift means that trends which are in progress (or even not yet begun) in the parent dialect will continue in and produce very similar if not identical changes in daughter dialects (or languages; Sapir's famous examples are the plurals of "foot/Fuss" and "mouse/Maus" in English and German). Examples here would be the loss of rhoticity in almost all Southern Hemisphere varieties of English, or the use of the FLEECE vowel rather than KIT as the final in HappY-type words (see Trudgill et al. 2000b for details). Thus the origins of NZE no longer seem to be a simple inheritance of traits from a parent Australian dialect into a daughter NZE, although unquestionably NZE has derived much of its idiom from its large neighbour across the Tasman. Donn Bayard. 2000. New Zealand English: Origins, relationships, and prospects. Moderna Språk 94 (no. 1, corrected in no.2): 8-14. The full text of this article can be dowloaded as a ".pdf" (Adobe Acrobat) file, with the kind permission of the Editor, Moderna Språk. The information on this page was provided on 8 October 2001.